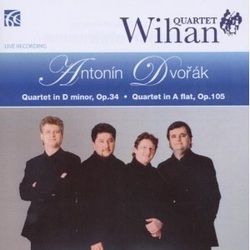 This is an immediately appealing disc: great Czech quartets …………… played by a great Czech quartet. 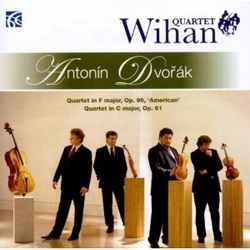 Dvořák’s quartet needs a big sound to work, which the Wihan Quartet provides, along with wonderful ensemble, sharp rhythms and forceful interpretations. The performance is large-scale, luxurious and full of high drama. It is not sentimental. No one who finds this combination of Dvořák, Suk, and Janáček alluring is likely to be disappointed by these carefully crafted and powerful performances. An excellent recording of great quartets. always engagingly presented by the Wihan Quartet. this version at the top of the recommended list. This is a superb interpretation. [This disc] is strongly recommended to all lovers of chamber music. reading that searches out real depth, especially in the slow movement. performances they convey the subtle nuances of dynamics. Excellent engineering. melody and intensity of expression that make both works rewarding. playing. [I ] salute the Wihan's impeccable refinement. emotional aspects of the music which the Quartet captures so well. and then go back to the beginning again. it is simply drop dead gorgeous. Here is something unusual ......warmly and dexterously delivered by the Wihan Quartet. their fibrous muscles they sound more like music. best quartets in the world today. seeks to transcend the limitations of Beethoven's so-called 'First Period'. release of The Late Quartets. Highly recommended. in the past 50 or so years. note: sweet-toned, and with superb articulation. the fresh look at the ensemble textures. of long, deep mutual experience.... achingly intense and beautifully controlled. We’re promised the middle and early quartets before the year is out. I can’t wait. live by a top quartet is one of the great musical experiences. Presto (Op131) is played with splendid vigour. complex, humane and spiritual masterpieces. assert that they are fully competitive with all the studio recordings in the catalogue.